Deena spent a week in Moorea before flying to the Gambier Islands, where she joined up with Aldebaran for a month of sailing. She also visited Papeete for a day, which she shares in another post (along with inter-island flight tips). 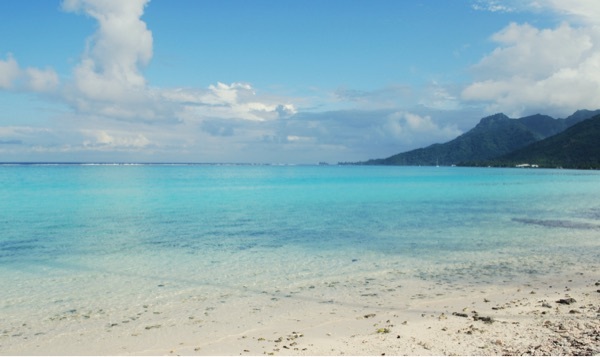 She shares her tips on visiting Moorea below. The ferry is the cheapest option and very easy. If coming from the Papeete airport, the taxi will cost around 2000 XPF (~$20) depending on how much luggage/people you have. You can also take a public bus for around $2 but if you have a lot of luggage, taxi will be way easier, since you have to walk a bit to get to the bus stop. The ferry schedule is online, you can buy tickets at the station and the trip takes about 30 minutes. From the ferry station in Moorea, you should ask your hotel/ airbnb about transport, usually they will pick you up. There is a small wifi hotspot in the ferry station at the cafe, it costs ~$4 for a hour, so you can connect to wifi if you need. I stayed in Maharepa, which was a great area for me because it’s close to where I took diving lessons and walking distance from enough things that I didn’t need to rent a car. I stayed in one place and learned about one other, both are recommended. They had kitchens, which was important to me as I cooked a lot (tap water is fine to drink). Eating out for all meals will get expensive if you’re staying for longer than a couple of days (lunch is usually $15-16 for a sandwich and dinner $25 for an entrée). 1) Poerani. These are small lovely bungalows with their own private strip of beach run by two lovely French men and a gorgeous large dog. I’m not sure of the price because I didn’t stay there. I think available on airbnb or just google the name. Diving, snorkeling. Amazing clear water. I got certified at Moorea Blue Diving, and they were great. I didn’t get to do the shark/stingray feeding that most guidebooks mention. Locals highly recommended the Lagoonarium to me, but I didn’t get to do that either. Dance show. A couple times a week the bigger hotels will have Polynesian dance shows. You can usually just go to watch the show, just buy a drink at the bar. It sounds touristy, and it is, but these dancers are really talented! I went to the one at Manava Beach Resort on Saturday night. Coco glace. Stands on the road will sell coco glace (cold coconut) for 200 XPF ($2). Some of the most delicious coconut water I’ve ever had. Don’t forget to have them slice open the coco when you’re done drinking so you can eat it. Belvedere Lookout. Second highest viewing point of the island, some places to hike around ancient sites on the way. Moorea Tropical Garden. Tricky road to drive, but lovely view, small vanilla farm, amazing jam and honey! If you’re visiting Aldebaran, buy some jam and honey to bring them. Juice factory. Semi-interesting, if you’re driving by. Where all the Rotu juice is made, and you can buy juices and alcohol at their store. Monoi factory. I forget the name, it’s on the xdaysiny.com blog, but this is a small sign (I almost missed it on the road) and you can buy different scented monoi oils that are made there. Temae public beach. Stunning light blue water, friendly locals. Moorea is just one big road that goes around the island, takes 2-3 hours to drive the whole thing. There is no reliable public transit. The best options are bike, walk, hitchhike (which I was told is common and safe). Taxis are super expensive, 4000XPF ($40) minimum usually, and typical car rentals might be around $100 per day. Most everywhere you go may offer pickups/dropoffs, including restaurants, so it’s worth asking.